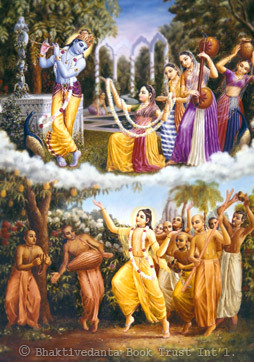 In a special appearance, Krishna personally came in A.D. 1486 as Sri Chaitanya Mahaprabhu and acted as His own devotee. Sri Chaitanya Mahaprabhu is Krishna Himself, saturated with the love for Him that Radha embodies. As the emblem of the perfect devotee of Krishna, He displayed feelings of the highest spiritual ecstasy. Krishna taught Bhagavad-gita to liberate all souls, and He returned as Sri Chaitanya to show us how to live by the Gita’s teachings. Because spiritual realization is difficult in the present age, Krishna as Sri Chaitanya Mahaprabhu is especially liberal. He has made pure love of God attainable by the easy process of chanting His holy names, as in the maha-mantra: Hare Krishna, Hare Krishna, Krishna Krishna, Hare Hare/ Hare Rama, Hare Rama, Rama Rama, Hare Hare.